Hi, I'm Lisa! In every issue of Brainwaves I am going to be assessing an aspect of neuroscience as it presents in popular culture. Read along as I take you through movies, books, music, and art to look deeper into how neuroscience is portrayed to a general audience. In this issue, I will be commenting on the movie Awakenings (1990), which tells the story of a scientific discovery made by Dr. Oliver Sacks in the late 1960s. 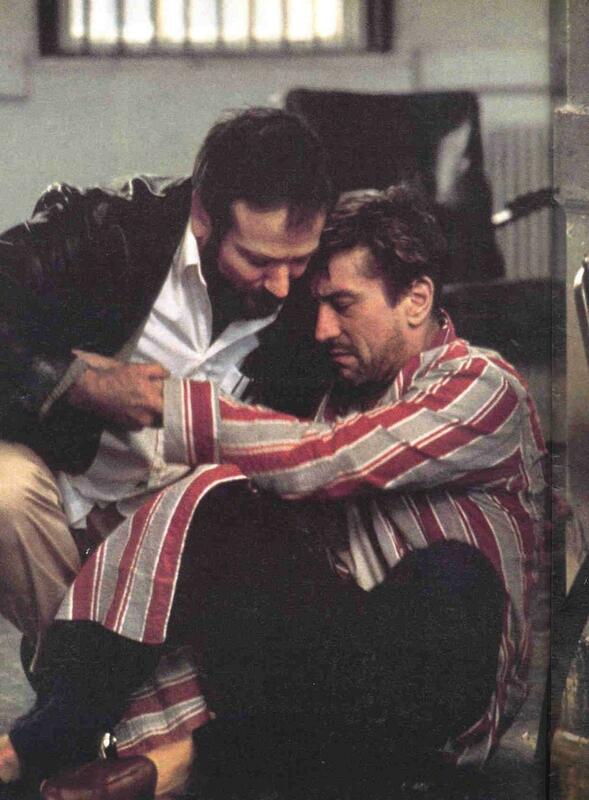 Robin Williams as Dr. Sayer and Robert DeNiro as Leonard in Awakenings (1990). Awakenings (1990), an Oscar-nominated film based on neurologist Dr. Oliver Sacks’ memoir of the same name, tells the story of Sacks’ scientific discovery while working with catatonic patients at a New York City hospital in the late 1960s. While movies tend to vary greatly in their accuracy in depicting the real-life events on which they are based, Awakenings does a wonderful job of recreating this true story and successfully brings this tale of neuroscience to the big screen. Awakenings opens with a glimpse into the childhood of one of its main characters, Leonard Lowe (later played by Robert DeNiro), who is a victim of the encephalitis lethargica epidemic that swept the globe from 1915 to 1926. Leonard experiences stupor (a state of near unconsciousness) when out playing with friends one day, and his sickness slowly progresses and makes it impossible to continue playing with his friends and attend school. We then jump forward to 1969, when Dr. Malcolm Sayer (Sacks’ fictionalized character portrayed by Robin Williams), a physician and researcher, applies for what he thinks is a research job at a hospital in the Bronx. Though his research experience is with non-human subjects, the hospital is understaffed and hires him on as a clinical neurologist. Dr. Sayer is assigned to patients experiencing a wide-array of psychiatric illnesses. However the story quickly closes in on a group of individuals unable to walk, feed themselves, or speak. Despite his colleagues’ apathy and reluctance to do the same, Dr. Sayer persistently tries to improve the quality of life for his catatonic patients. He seeks to learn more about them, diligently reviewing their medical files and discovering that they all share a history of encephalitis lethargica. This leads him to Dr. Peter Ingham, a physician who described the “post-encephalitic syndrome” of the “children who fell asleep” in the late 1930s: survivors of the epidemic who were brought back for assessment 10 to 15 years after first being infected due to the reappearance of their catatonic-like symptoms. When speaking with Dr. Ingham, Dr. Sayer wonders if these patients have thoughts, something that is quickly dismissed as impossible but that remains on Dr. Sayer’s mind. Dr. Sayer continues to learn more about his patients, discovering five whose catatonic states he can reach past through the use different stimuli: activities like catching a ball, listening to a familiar tune, maintaining physical contact and using a Ouija board provide insight into the lives of these “trance-like” patients. Dr. Sayer then attends a conference where he learns about Levodopa (L-DOPA), a new drug that crosses the blood-brain barrier and that is metabolized into dopamine for treating Parkinson’s Disease. He wonders if the culmination of symptoms seen in Parkinson’s could lead to the catatonia experienced by his patients, therefore making this drug a potential treatment. He convinces the head of Neurology, Dr. Kaufman, to allow him to begin experimenting with L-DOPA on Leonard. After falling asleep at Leonard’s bedside, Dr. Sayer wakes up to find Leonard “awake” as well, sitting at a table and legibly writing his name for the first time in decades. As Leonard continues to improve and gain more motor control, Dr. Sayer convinces donors to fund the L-DOPA treatments of the remaining patients, “awakening” them from their catatonic states. I was touched by the excitement that the patients feel as they gained more control over their movements and felt their pain as they came to realize that they’d missed out on thirty years of their lives. Leonard, having regained what appears to be almost full functionality, is eager to leave the hospital and live the remainder of his life to the fullest. After being restrained and told he is unable to leave due to the experimental nature of the treatment, he becomes visibly agitated and experiences dyskinesia. Despite increasing the dosage of L-DOPA, Leonard’s condition slowly worsens, foreshadowing the future of the other patients receiving the treatment. Although I was heartbroken to see the patients deteriorate, it was inspiring to see Leonard insist for Dr. Sayer to continue learning through his experiences. The patients continue to have “awakenings” as different treatments are experimented with over the years, though none as profound as those experienced in the summer of 1969. Leonard (DeNiro) dances with Paula (Penelope Ann Miller), the daughter of one of his co-patients. Having never heard of Dr. Sacks’ discovery prior to watching Awakenings, this movie piqued my curiosity and inspired me to look more into what truly happened with his catatonic patients. I learned that although the characters’ names and methodology for the experiment changed (instead of administering L-DOPA treatment to one patient, the experiment was double-blind, placebo-controlled and conducted on twenty patients over the course of ninety days), the movie stayed true to Dr. Sacks’ story, accurately bringing neuroscience to popular culture and inspiring the neuroscientist within viewers. As someone who is looking to further my background in neuroscience, Awakenings encouraged me to research both Parkinson’s disease and encephalitis lethargica to determine how L-DOPA could be used to treat the symptoms of each condition. I learned that both are characterized by two distinct types of symptoms: the first type are likely associated with a deficiency of dopamine and therefore may improve with L-DOPA treatment; the second type, likely associated with the neurological damage caused by oxidative metabolites of dopamine, will increase in severity with an increase in L-DOPA treatment. Research has shown that L-DOPA treatment for Parkinsonism may initially be effective however tolerance develops and the increasing severity of adverse effects such as dyskinesias and psychosis eventually outweigh the benefits. A similar phenomenon was observed in Sacks’ catatonic patients as they gradually required an increase in L-DOPA dosage from 500mg/day to 6mg/day and experienced a “reversal” of the beneficial effects of the treatment over time. This was clearly seen in Leonard’s case as he gradually “woke” from his catatonic state, slowly regained motor control, and later exhibited Parkinsonian-like symptoms. 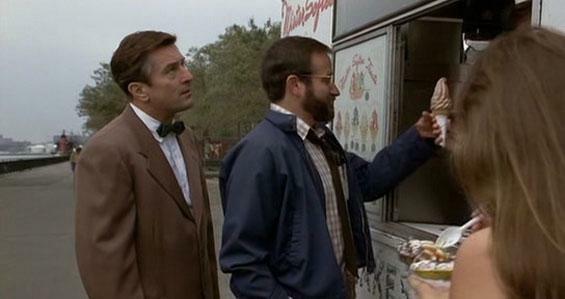 Leonard (DeNiro) and Dr. Sayer (Williams) venture out of the hospital to grab ice cream! DeNiro and Williams both do a fantastic job of portraying their characters’ experiences, convincing viewers of the significance of this discovery and making them feel as though they too were in that NYC hospital during the summer of ’69. After witnessing the ups and downs of Sacks’ patients, viewers are also able reflect upon what Sacks’ learned from his patients: although he did not know what went wrong at the time, Sacks’ that the “human spirit is more powerful than any drug”, “awakening” his own desires to live a full and complete life. 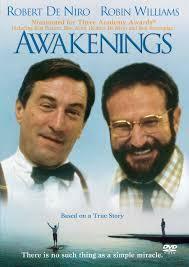 Awakenings is both touching and informative, doing a wonderful job of bringing neuroscience to the movies! Foster, H. D. & Hoffer, A. (2004). The two faces of L-DOPA: benefits and adverse side effects in the treatment of Encephalitis lethargica, Parkinson’s disease, multiple sclerosis and amyotrophic lateral sclerosis. Medical Hypotheses, 62, 177–181. Lasker, L. & Marshall, P. (1990). Awakenings. United States of America: Columbia Tristar Home Video. Sacks, O. (1983). The origin of “Awakenings.” British Medical Journal, 287, 1968–1969.